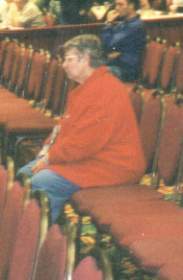 She may walk with a cane and just barely, but as she hobbles slowly across the tournament floor, the name Helen Warren strikes fear into the hearts of chess players everywhere. Most recently famous for the fiddle points fiasco, Helen Warren was probably not recognized by many chess players, because she is primarily a chess politician. She came to the National Open in Las Vegas to press her political agenda on other politicians, including Myron and Rachel Lieberman. In one photo, she walks slowly across the playing hall. In the other, she sits pretending to be interested in watching the grandmaster games on the demo boards, even though she is only rated 1440. Are these Floozies at the Bar or Chess Grandmasters? Why does Sam like the Republic of Georgia so much? Should new Scholastic Players get chess ratings? What is Libel per se?